It's Halloween and that means it's time for my favorite makeup tutorial of all – Day of the Dead. Day of the Dead is celebrated from October 31 through November 2, honoring the deceased at alters adorned with sugar skulls. My take on the holiday pays homage to decorated sugar skulls using vibrant purple and green. I used a Snazaroo face painting kit for this Halloween look. Their face paint is a water-based powder. Just get the product wet with the applicator brush or sponge to apply. That also means it's easy to remove. A plus when using dark colors. Here's the step-by-step tutorial in pictures using green, purple, black, and white. In addition to the brush that comes in the kit, I used my own angled brow brush and precise eyeliner brush. Outline and fill in eye socket in green. Create flower petals around the green in purple. Use black to line between the green and purple using angled brow brush. Outline each petal in black with eyeliner brush. Dot inside each petal with white. Create small teardrops with green. Dot inside each teardrop with white. With eyeliner brush and black, draw a web across your forehead. Draw a large teardrop in the center between the eyes. Fill in where the nose socket would be with black, leaving the center of the nose blank. Draw an upside-down T under the nose. This creates a "spade." Fill in lips with purple. Draw a line with black and the eyeliner brush from the corner of your mouth out, ending in swirls. Create teeth with lines, perpendicular to the mouth line, from one end to the other. Embellish with black, purple, and white using teardrops, swirls, and dots. There's the complete makeup look. 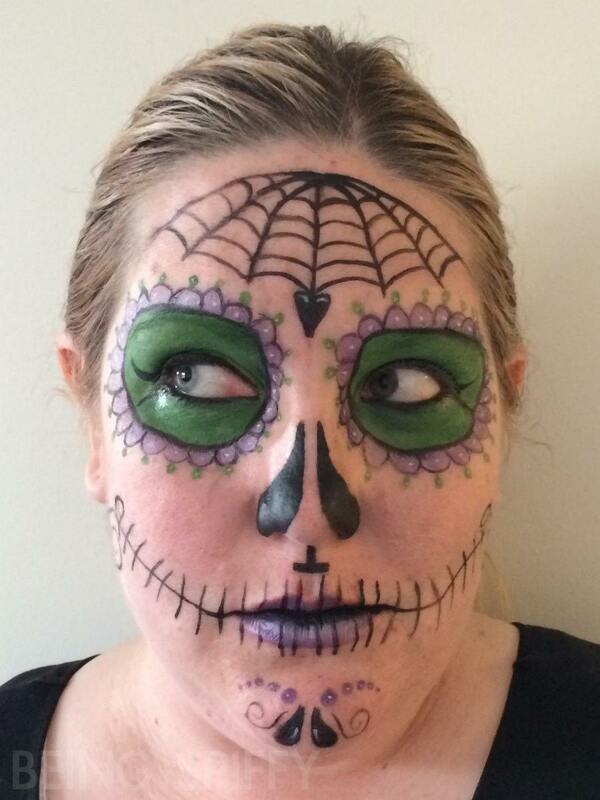 The beauty of the sugar skull is that you can embellish however you'd like. Flowers, flourishes, the sky's the limit. Would you wear this makeup look for Halloween?